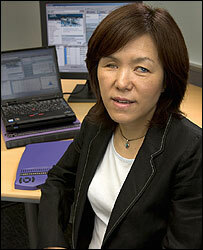 The A-Browser is the creation of Dr Chieko Asakawa, a blind employee at IBM's research laboratory in Tokyo. The volume controls also allow the user to adjust the sound of various sources independently - for example the main audio track, an audio description track and output from a screen reader. "We're beginning to look at accessibility as a very important business area," said Frances West, director of IBM's Human Ability and Accessibility Centre. "This is not just from a social responsibility standpoint, but with ageing baby-boomers we think that such technology could really benefit the population in general because all of us will be on this ageing journey." The company plans to "open source" its new accessibility software in order to make it available to the largest possible number of people.